With the towering ridges of the Cascades mountain range, the refreshing salty air of Pacific seaways, and lush greenery of the temperate rainforest climate the Pacific Northwest region has long been renowned for its natural beauty. 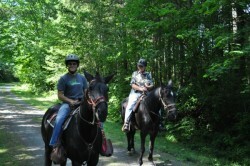 Both locals and visitors alike appreciate taking in the splendor the region by horseback. eas. Thanks to long-term vision, effective planning, and cooperation between government agencies and the local horse community, equestrians today and in the future will also be able to enjoy all that this spectacular region has to offer. The KCRTS can serve as a model for equine friendly trails in and around urban areas in other parts of the country. This impressive network of shared-use paths has proven popular for a multitude of outdoor activities including bicycling, hiking, walking, skating, dog walking, and horseback riding. Planning is Keylity for multi user groups. King County has acquired forest conservation easements on over 200,000 acres of private and publicly owned forest lands along the trails over the last decade. Although not required to do so, many private landowners of the County’s conservation easement properties have chosen to provide public access to hundreds of additional miles of trails for non-motorized recreational use. rograms that provide incentives for land owners to provide trail opportunities (such as the Public Benefit Rating System). Many of the trails that are protected through these provisions eventually become part of the King County Park System. King County also illustrates how cooperation between government agencies, various municipalities, and equestrian groups benefits all parties. “The regional trails are an ever-growing network of paths owned, developed, and managed by multiple agencies,” said Foxworthy. “King County owns and maintains the largest part of the network but the Washington State Department of Transportation (WSDOT), Seattle, and other cities also have their own regional trails that add to the overall network. For more rural areas, King County Parks also created a Backcountry Trails Crew that focuses solely on maintaining and constructing the backcountry trails. As advocated by the Equine Land Conservation Resource, in order to ensure continued access to land for equine use, horsemen and women must make their needs known in local land use issues. In King County, a strong rapport between government and area equestrian groups such as the King County Executive Horse Council (KCEHC) demonstrates how this relationship works well. 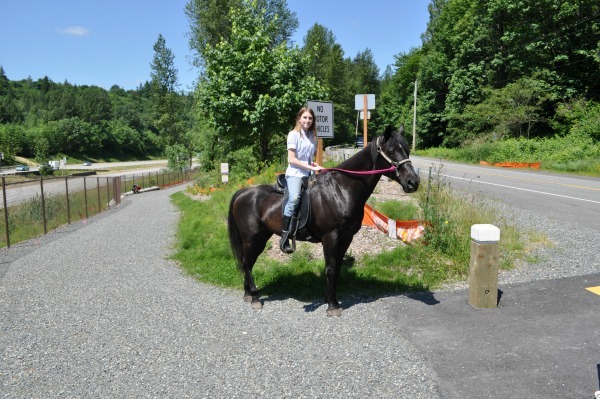 Dedicated KCEHC officers and volunteers contribute in a variety of ways to the continued success of equestrian use of the trail system, including advocacy for the horse industry, equestrian way of life, and protection of land for equine use. The KCEHC keeps track of City, County and State legislation that will affect trails and the equestrian lifestyle, receives notices of pending development, and determines whether or not these developments will impact trails. The spirit of cooperation goes beyond sharing the trails as Foxworthy reported that his staff are working with a local horse group interested in building an equestrian facility that could include such features as an outdoor arena with an obstacle course, cross-country jumping, access/amenities for disabled/therapeutic riding, a parking facility as well as a network of trails connecting to adjacent public land. Joint efforts such as this and others across the country illustrate even further how public private partnerships between equestrian groups and local government can expand opportunities for all equestrians while protecting access to land for equine related activities. To learn more about the King County Parks as well as the Regional and Backcountry Trail Systems, visit http://www.kingcounty.gov/recreation/parks/trails/regionaltrailssystem.aspx.